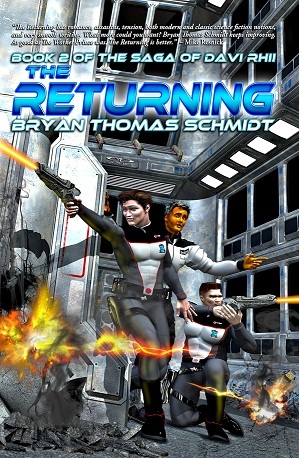 In Bryan Thomas Schmidt’s second novel, The Returning, new challenges arise as Davi Rhii’s rival Bordox and his uncle, Xalivar, seek revenge for his actions in The Worker Prince, putting his life and those of his friends and family in constant danger. 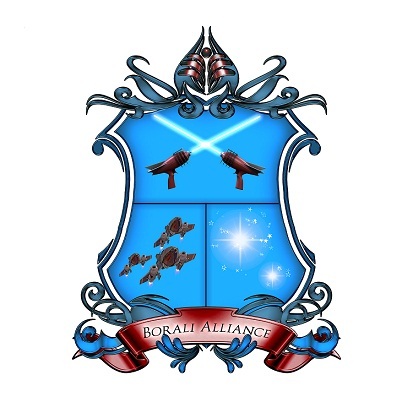 Meanwhile, politics as usual has the Borali Alliance split apart over questions of citizenship and freedom for the former slaves. Someone’s even killing them off. Davi’s involvement in the investigation turns his life upside down, including his relationship with his fiancée, Tela. The answers are not easy with his whole world at stake. Bordox fought his every instinct as he stepped off the shuttle into the starport landing bay on Legon. His mission required stealth, yet he stiffened at having to sneak around a place he’d once walked freely—admired and respected. Here he was, less than a year later, hiding in shadows like a wanted man. And there was only one person to blame: Xander Rhii! He made his way through the pedestrian corridors and deliberately avoided areas frequented by pilots and maintenance crews with the hopes he’d be less likely to be recognized. The datacard in his pocket pressed against his leg with every step. He just needed to get to the flight data booths and insert it. The program it contained would do the rest, drawing out the desired intel from the systems, and he’d be on his way again. He knew that voice, stopping to listen as it came from around the corner ahead of him. Rhii! Bordox gritted his teeth. His old enemy, the idiot who’d ruined his life, was coming toward him. What was he doing here this time of night? Last he’d heard Xander was a squadron commander. Military pilots didn’t casually walk around this side of the starport. Xander and the woman appeared around the corner and stopped as Xander jumped into her path so they were face to face. The woman was medium height, shorter than Xander, with long, brown hair and sparkling, blue eyes. Her pleasing curves stiffened in anger as Xander blocked her way. Both wore Borali Alliance flight uniforms with rank insignia on their shoulders and blasters holstered at their sides. Seeing Xander in uniform just launched him into a rage. Rhii had the career Bordox deserved. She stepped around him and continued down the corridor as he hurried after her. The woman, Tela, sighed. “I am not some delicate damsel in distress, Davi Rhii. I’m a fully qualified Borali officer, just like you.” Davi! Such a stupid nickname! A slave name. The idiot’s preference for that alone was evidence of his incompetence. She whirled and started up the corridor toward Bordox again. He slipped further back into the shadows, sliding his hood up over his head as he enjoyed the show. They were so distracted with each other he doubted they’d even notice him. Bordox began to relax from his rage a bit as he watched Xander Rhii get put in his place by a woman. The only thing better would be the day he finally did it himself. Like instinct, his hand felt for the blaster at his hip, closing around the handle, he squeezed it. All he had to do was draw and shoot and Rhii would be dead. They would never see it coming, totally taken by surprise. His fist clenched and unclenched around the handle as he fought the urge. He’d blow his mission. But he might never get a chance like this. The feel of the cold steel of the blaster against his palm got his adrenaline pumping. Tela groaned and punched him hard in the arm. “Well, I don’t.” She turned and marched on down and through the door into the landing bay as Xander raced to catch her. Bordox paused a moment, tempted to follow, but shook it off, remembering his mission and slid on down the corridor the way they’d come. There was more at stake. He had to remember that. Rhii’s day would come. Just not today. In less than two minutes, he’d stepped into the data center and selected a private booth. He slipped the datacard from his pocket and inserted it into the terminal then watched as the screen exploded in thousands of numbers moving and changing at a pace so fast his eyes could barely recognize them. After another minute, the terminal beeped and the datacard ejected. He returned it to his pocket then slipped out and headed back the way he’d come. Bryan Thomas Schmidt is the author of the space opera novels The Worker Prince, a Barnes & Noble Book Clubs Year’s Best SF Releases of 2011 Honorable Mention, andThe Returning, the collection The North Star Serial, Part 1, and has several short stories featured in anthologies and magazines. He edited the new anthology Space Battles: Full Throttle Space Tales #6 for Flying Pen Press, headlined by Mike Resnick. He also has a children’s book 102 More Hilarious Dinosaur Jokes For Kids from Delabarre Publishing. As a freelance editor, he’s edited a novels and nonfiction. He’s also the host of Science Fiction and Fantasy Writer’s Chat every Wednesday at 9 pm EST on Twitter, where he interviews people like Mike Resnick, AC Crispin, Kevin J. Anderson and Kristine Kathryn Rusch. A frequent contributor to Adventures In SF Publishing, Grasping For The Wind and SFSignal, he can be found online as @BryanThomasS on Twitter or via his website. Bryan is an affiliate member of the SFWA. Cheap nike plus size jerseys for 5xl, 6xl, 7xl, size 50, size 60, wholesale online from china free shipping.Buy now to get best price. This entry was posted on June 6, 2012 by sheilahollinghead in Book Excerpts and tagged Bryan Thomas Schmidt, The Returning. Follow Readers Realm by Email! Follow Readers’ Realm on Twitter!